Planning out your stage performance can be problematic if you have no idea what to do. Here are some tips and visuals from our episode on how to tackle your performance! The advice on the podcast and here on this blog are for your reference. These are not the rule, but guidelines to help beginners and masters alike help come up with ideas and plans for one's stage performance. Feel free to adapt and make your stage performance all your own! We love seeing how much everyone can improve on each other's ideas. 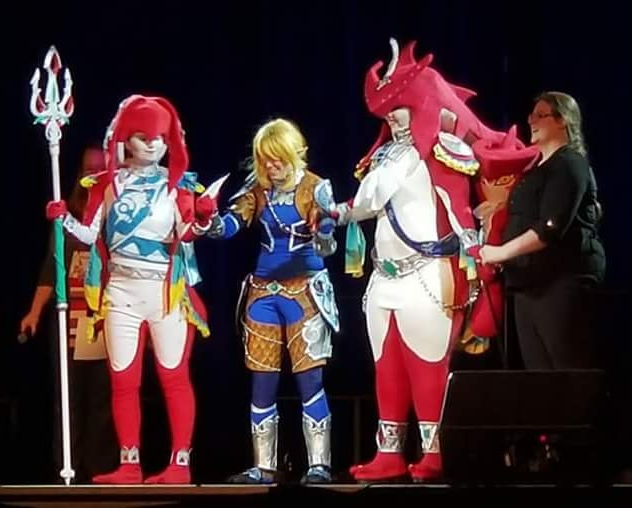 MommaSammu as Mipha, VFire as Link, Pannon as Prince Sidon, and Sadee puppeteering Baby Sidon. Photo courtesy of Anime Los Angeles. Tip #1: Make sure you know how much time you have on stage and if needed, ask how big the stage will be. This is important to help you practice and know just how much room and time you need to tell your story. Tip #2: Whether it is a walk on or a skit, try to tell a story and/or show off your cosplay. Make sure to cover the whole stage as keep it looking interesting. One bit of advice I was told was to do something different every 15 seconds. In the above image it would take about 5-ish seconds to get to spot 1. There I would pose or do some interaction for 5 - 10 seconds. Then I would move onto spot 2 by either walking over or doing some sort of movement that would make my character feel in character (for example, if I were a zombie I would shamble over to each spot instead of walking briskly.) At spot 2 I would once again do a pose or interact for another 5 - 10 seconds before moving onto center stage. At center stage I would be running out of time so here I would end with something dramitc. Think about how you want leave a lasting impression! 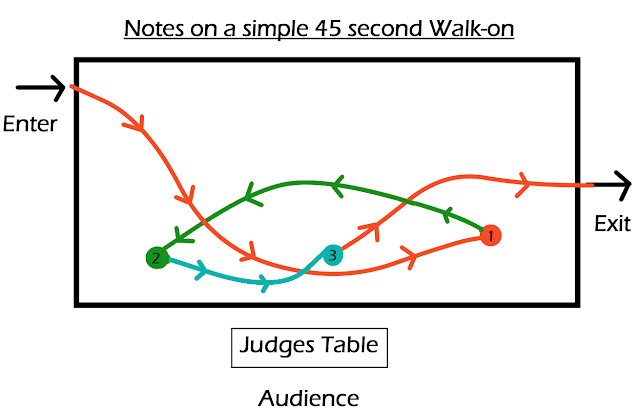 Tip #3: Using drawings like the one above can help you visualize your skit or walk on. They don't have t be fancy or well drawn either. Here is a sample from Pannon, VFire's and Momma Sammu's skit plans for Anime Los Angeles 2018. We were all working long distance to plan our skit so these drawings helped us get an idea of what to do on stage. VFire's art skills at their finest am I right? 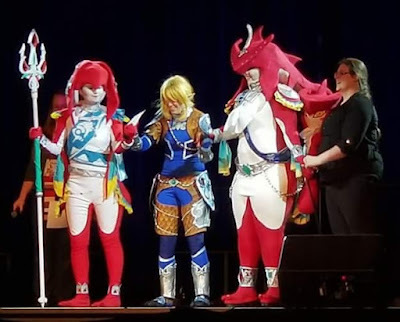 As you can see the blue blob is Link, Sidon has a shark face, and Mipha has her blue sash. All drawn real fast to communicate what we wanted to try. We also put in timing notes and this reference is done from the view of the audience instead of overhead. Tip #4: In this skit we had no speaking parts as we used a song to portray the feelings on the characters. Tip #4 would be to do your best to SHOW versus TELL. If you have to explain a deep meaning or complex story to the audience, maybe try scaling it back and get it's simplest form out. Remember, you only have a short amount of time on stage. The simplest version of the story will communicate best. Tip #5 would be to not be scared of having to change things. Once we got together we realized we had to change part of our set and that various parts needed to be swapped or shortened because of the stage size. Here is the final version of our skit on stage! Thank you AC Paradise for recording this event! Hope you enjoyed the terrible drawings and maybe learned a thing or two that may help you in your next contest! Thanks for reading!